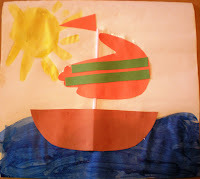 The next summer handprint activity from my Hand-Shaped Art book is a sailboat. It is very simple, but feel free to jazz it up! The first thing I did for this creation was to paint a peaceful background. I thought it would be fun to add some salt to the paint--like saltwater. Not a good idea. If you are like me and don't know anything about chemical reactions, this is what happened. 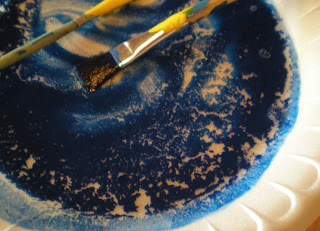 I added the salt to a big glob of blue paint. The paint immediately melted into a pool of "water." Then the paint started to separate from the liquid. To be honest I found this quite fascinating. I didn't know that would happen when salt was added to paint--now I do. Anyway, I thought maybe the blue water would look neat if you added some glitter to it. I didn't have any glitter on hand. I quickly used my watered down version of tempera so as not to waste it. If you have some glitter, sprinkle it in the paint and mix. 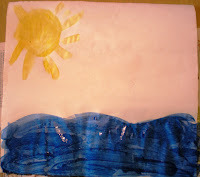 I painted some blue water and a yellow sun. 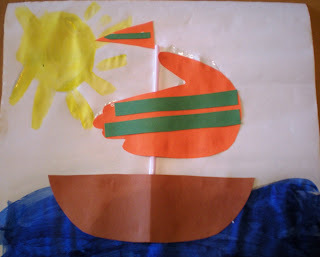 You don't have to paint a background, maybe the children would like to draw something, or use some scrap paper. Ripping some blue paper and gluing it down would make some neat looking water also. After the hand and flag are cut out allow the children to decorate them. I was looking for some stickers, but didn't have any, so I used to scrap paper. Maybe they would even like to paint them. Now it's time to glue it all together. I glued the straw down first. 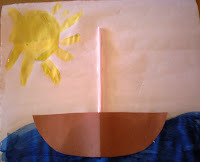 Then I glued the bottom of the boat over top of the straw. The flag gets glued to the top. Lastly comes the sail. 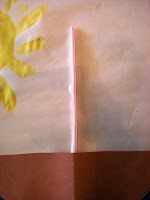 Glue the sail on top of the straw with the thumb touching the straw at the top. Sit back and imagine yourself floating peacefully in the water. Sun streaming down, birds flying by, dolphins appearing every once in a while---aahh doesn't that sound nice! This looks like lots of FUN! I randomly found your blog - I think from the momblogs site - and woohoo!! Sooo happy I did. There's nothing like some great crafts to get through a morning. :D I'm off to check out the book. Oh and the thoughts of sitting back and relaxing? Ahhh, much needed too, thanks. ANything with handprints is my type of project. Great idea! I have been clicking my way through the blogosphere and recently found your wonderful blog. What a fantastic book. This book sounds like it would be the perfect inspiration for making gifts for family members. I am going to check this book out.